Hotels are at the epicentre of most people’s travels. They hold myriad stories of love and romance, family, work, and friendship. They are places to sleep in and stretch out, to lounge, read, write, and think. They are places to come back to at the end of a long day and fall into bed, exhausted. And, they are places to meet people from all over the world, to share stories and exchange ideas. Jeremy Mason McGraw, our CEO and Creative Director, has always been captivated by hotels. For him, they are host to all of the vibrancy, and color, and adventure that travelers seek. They are a crossroads for people, and ideas, and energy. An intersection where travelers with different backgrounds who are doing different things briefly meet before continuing to speed away from each other. 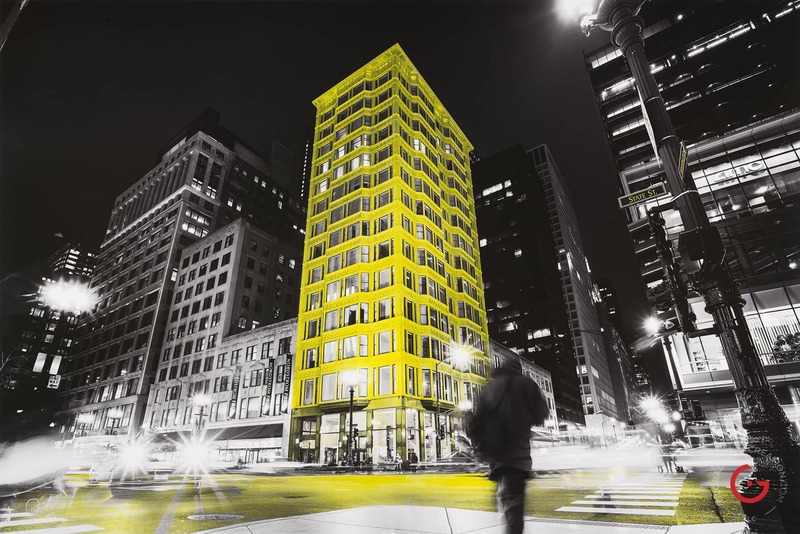 When Jeremy Mason McGraw traveled to Chicago to capture images of Staypineapple’s Chicago hotel, he discovered not only a beautiful, historic, and architecturally significant building right in the middle of the city, but also a literal representation of the concept that captivated him. 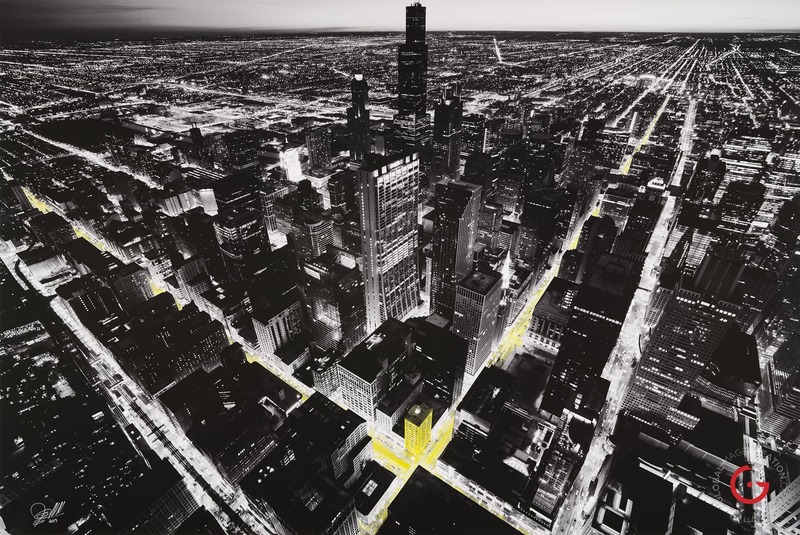 The Staypineapple Chicago sits at the intersection of State and Washington: an intersection of cars and people that reflected the flow of energies he imagined coursing through the Hotel. 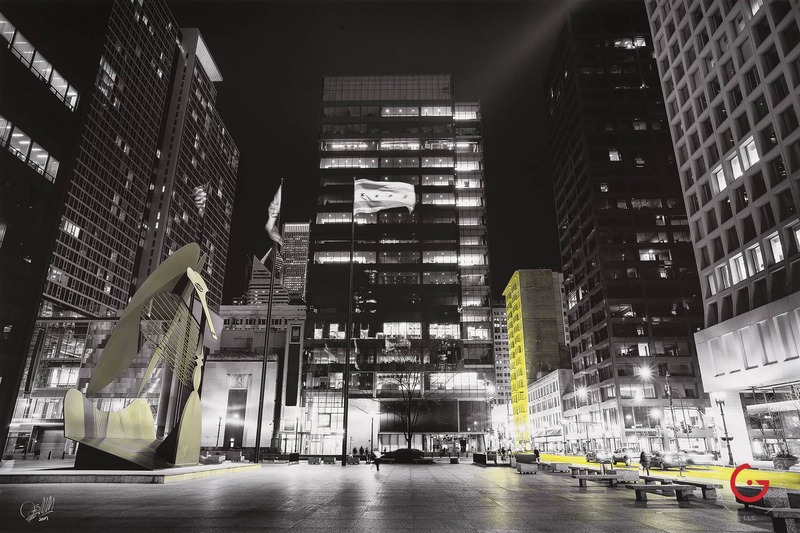 Jeremy explained his vision to Staypineapple, and proposed creating original art works for the rooms at the Staypineapple Chicago featuring the hotel and depicting the energy he saw, artwork that would be completely original and unique to the hotel. Staypineapple was quick to see his vision, and commissioned Jeremy to capture five images from five different angles, including one from a helicopter. 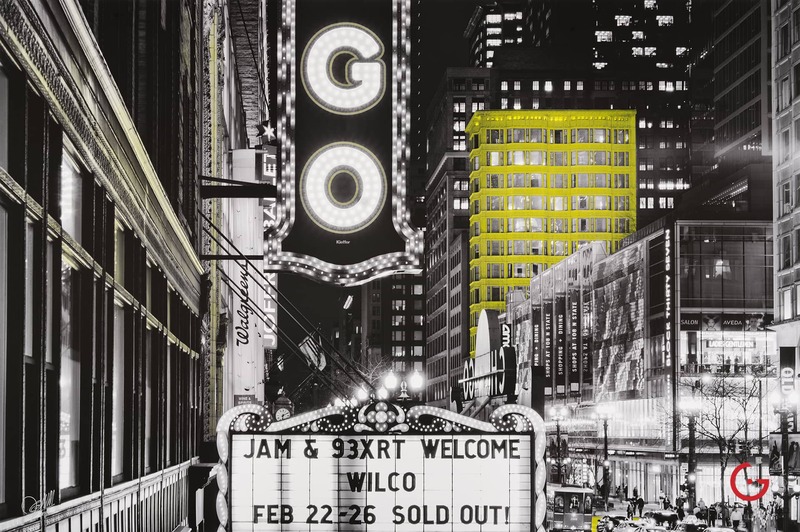 In each image, Jeremy incorporated the intersection, the hotel, and any culturally significant nearby Chicago landmarks. 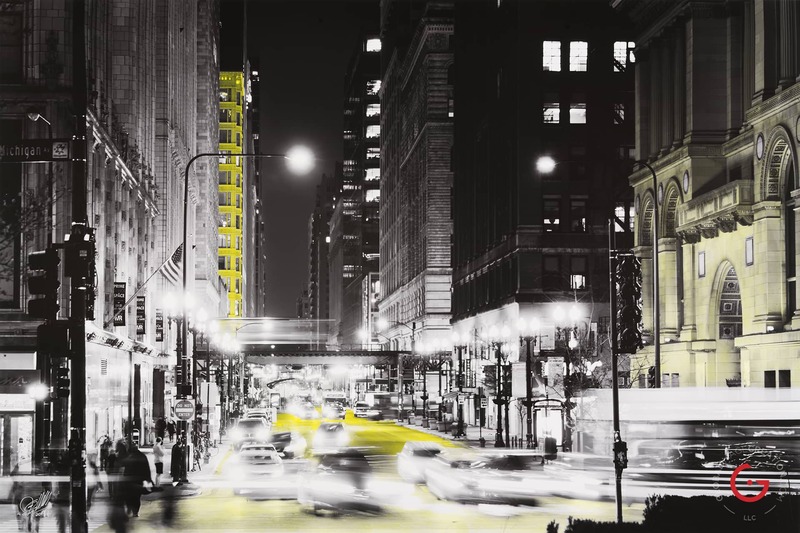 He then produced the images in black and white, and hand painted the flow of energy he imaged coursing through the intersection, the hotel itself, and the nearby landmarks. 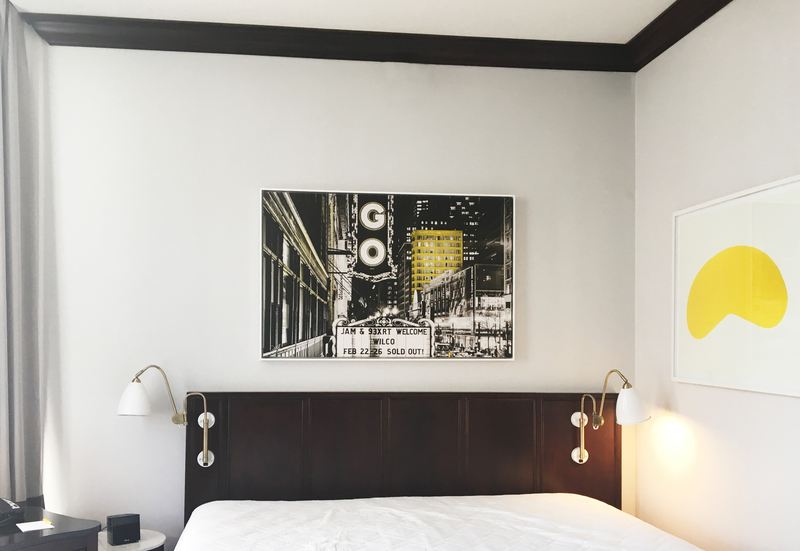 Intricately and professionally crafted digital prints of these images now hang in the rooms of the Chicago Hotel, adding a unique texture to the experience of being a guest of the hotel.